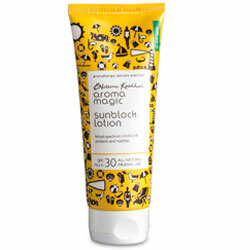 Buy Aroma Magic Sunblock Lotion SPF 30 PA++ - Protects & Mattifies - Promote Elasticity & Provide Smart Sun Protection. Broad-spectrum UVA/UVB. Protects and mattifies. All skin types. 100 % free of oxybenzone, parabens, harsh chemicals, alcohol and artificial fragrance. All-mineral, ultra effective formula creates a physical barrier between you and the sun. Non greasy, skin friendly and enriched with carrotseed, wheatgerm and jojoba oils. Notes of helichrysum, calendula and roman chamomile essential oils heal scars and mattify your skin. Green tea extracts promote elasticity and provide smart sun protection. Knead the tube with your hands and give a good shake as natural ingredients tend to separate. Apply me generously 15 minutes before sun exposure for desired protection. Use 1/2 tsp. to protect your face and 1 tbsp. to cover skin from head to toe. A perfect complement to your daily make up routine too. Note : Reapply every 90 minutes and every 30 minutes if you are doing anything active, that's causing you to work up a sweat and always after swimming.